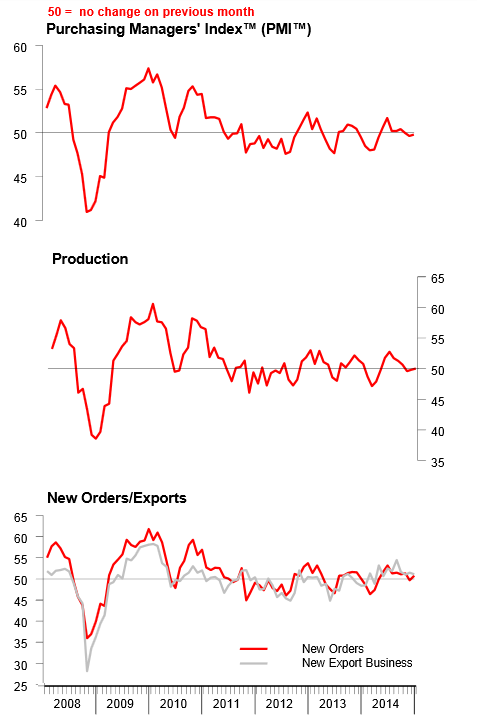 It's pretty much the status quo for the HSBC Flash China Manufacturing PMI report. 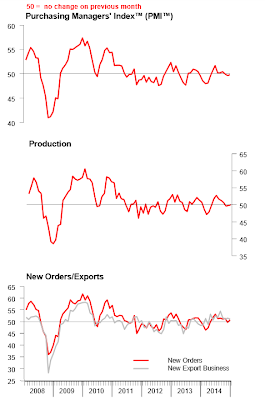 Flash China Manufacturing PMI at 49.8 in January (49.6 in December). Two-month high. Flash China Manufacturing Output Index at 50.1 in January (49.9 in December). Three-month high. When a rise from 49.6 to 49.8 puts you at a high (with 50 being the break-even point between contraction and expansion), you cannot possibly be moving fast. Flat-lining in slight contraction is the best phrase to describe the current state of affairs in China. The following charts show just that. China's manufacturing PMI has hovered in a range just under and just above the 50 expansion-contraction line since mid-2011. More Easing to Support Growth? How much more easing can the world even take? The answer depends on how much bigger current asset bubbles can get. And no one knows the answer to that. Regardless, all this "easing" at this point is counterproductive. It will lower consumption in Europe for reasons explained by Steen Jakobsen, chief economist at Saxo Bank in "ECB About to Make Biggest Mistake in History". Michael Pettis at China Financial Markets echoed the same views in regards to both China and Europe as noted in Grand Experiment Failure; Bankers Prefer Bubbles; Europe is not USA; Final Epitaph.